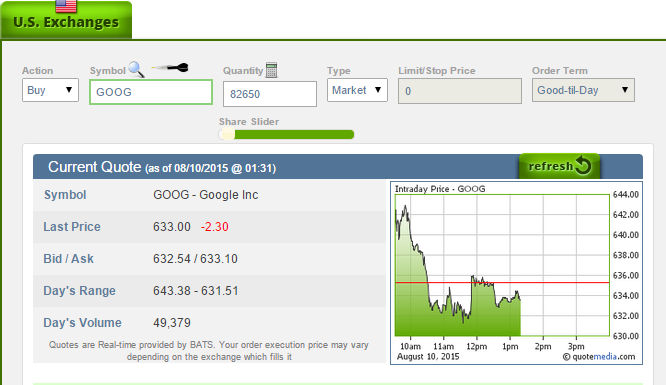 We now have real-time quotes on our trading pages, so anyone can see stock’s prices in real time! You can try out the quotes tool on the right hand side of the page, or click here to try our free trading simulator to get real-time bid/ask, volume, and last price quotes. All our real-time quotes are provided by the BATS exchange. What are the other types of quotes? Most providers will give either 15 minute delayed quotes, or end-of-day prices for stocks. This means that the price you would see would be either 15 minutes old, or the closing price from the last trading day. We upgraded to real-time to make sure we have the best free paper trading simulator on the internet! So now all my orders will fill exactly at the price I see on the preview? These prices are based on the BATS exchange; depending on the last exchange that actually fills an order, the price could be different. The price difference between exchanges is usually minimal, but it could be that very low volume stocks could see different prices on different exchanges. If you place your order after the markets have closed, it will execute on the next trading day at the opening price. For more information about our stock market game, click here to read our virtual trading FAQ.